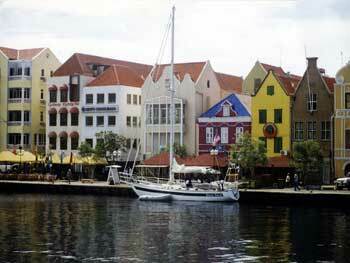 Gus & Marcella of the charter catamaran MAROLANGA have reduced their rates for Summer 2007. The rates mentioned in this post were for 2007, so are no longer in effect. Please contact Paradise Connections for more info. Laura just returned back to Storm Petrel after spending a couple of weeks in the States. They plan to charter in the Virgin Islands through mid June and then they will be heading up to New England for their summer season. 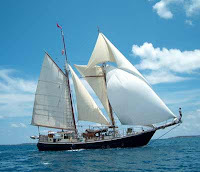 So, if you have the time and would like to come on down for a sail in the Caribbean, Storm Petrel is available from May 14 through June 2, 2007. We have a booking with them for the following week and then they will make preparations and head up north. If you cannot make it down here this summer, perhaps you'd like to charter with Phil and Laura out of Newport, Rhode Island. Phil is from that neck of the woods and has an incredible amount of local knowledge about this area. It would be a fun trip. Perhaps a 4th of July charter? I was very impressed by the speed, personal touches, accuracy, and sincerity when communicating with Bob and Sheila of Paradise Connections. I felt like I was dealing with a most competent and trusted friend, yet we had never met. We had a wonderful time this is my best vacation ever. After taking the winter off from chartering, Bonnie Lynn has reopened their calendar and they are available for your sailing vacation this summer in Maine. It would be hard to find a more authentic Maine experience than sailing with Captains Earl and Bonnie Mackenzie on the schooner Bonnie Lynn that they designed and built in Maine. Bonnie Lynn's layout provides flexible accommodations for up to 6 guests in 3 cabins with double and single berths. Earl's earliest memory is being on his father's lobster boat in Friendship, Maine. He has skippered yachts and work boats since his teens, served 20 years in the Coast Guard Reserves and was co-owner of a boatyard. Bonnie grew up in Michigan, joined the Peace Corps right out of college, traveled a lot and started sailing more than 20 years ago. She is a caring hostess and a very accomplished cook – especially seafood, lobster & chowder. Each cabin has teak and mahogany paneling. From the main salon you have easy access to the foc'sle, where there is a lounge area and library. Mahogany cabinets grace the luxurious galley. The private air conditioned cabins have hot and cold running water and adjoining heads with showers. The walk-in engine room is state of the art. The wheelhouse and midship's deck both have exquisite antique bronze wheels and pedestals. She has a lovely on deck mahogany table that seat six guests, plus three double hammocks that extend from the side decks and the foredeck. 'Bonnie Lynn' comfortably accommodates large groups for day sails. She has a sailing dinghy, an inflatable, snorkeling gear, two kayaks, and float mats to enhance a quiet morning spent in a secluded cove. She also has a full mid-ships and foredeck awnings with removeable clear side and front panels that allow guests to be on deck regardless of the weather. There is also an awning while under sail, allowing guests to have protection from the sun if they wish. 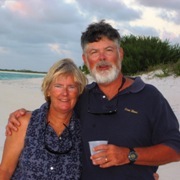 For those of you who know Judy & Bryan of ex-charter yacht s/v Ursa Minor, we'd like to let you know that we received an email from them this morning from the Galapagos Islands. They transited the Panama Canal this April (2007) after hanging out for a bit down island, Venezuela, San Blas islands... They set off last year for their circumnavigation and it looks like they are doing it right! Taking things slow and easy. 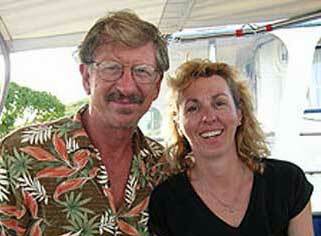 All the best, Judy & Bryan! Keep in touch! 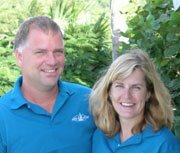 We are doing the happy dance as Rob & Michele aboard Island Skipper have announced that they will be chartering for a few weeks next season. Hurray! Island Skipper is one of our favorite charter yachts / crews and we have our most repeats with them. Rob & Michele are truly doing it right. Island Skipper has opened their calendar for the period of December 19, 2007 through February 3, 2008 for yacht charters in the Virgin Islands. Rob is a PADI Dive Master & Island Skipper offers 5 dives/week to certified divers for $125/wk/diver. We know that many of Island Skipper's previous guests will be scrambling for these dates, but we wanted to share this wonderful opportunity with others as well. Hope you can manage a quick getaway!